Before this voyage comes to a happy and successful end I wish to use this opportunity to give my grateful thanks to all those who have made this ambitious project possible, and who continued to support me throughout the long time it took to complete. I must, of course, start with Aventura herself, and those who created her. On the right side in this photo taken shortly before Aventura left the boatyard in Cherbourg in May last year, is Stephan Constance, the CEO of Le Grand Large, a group that comprises not only Garcia Yachting but also the builders Allures, Outremer and Alumarine. Stephan has been the main force behind this challenging project and without his visionary input and selfless commitment, it would have never come to fruition. 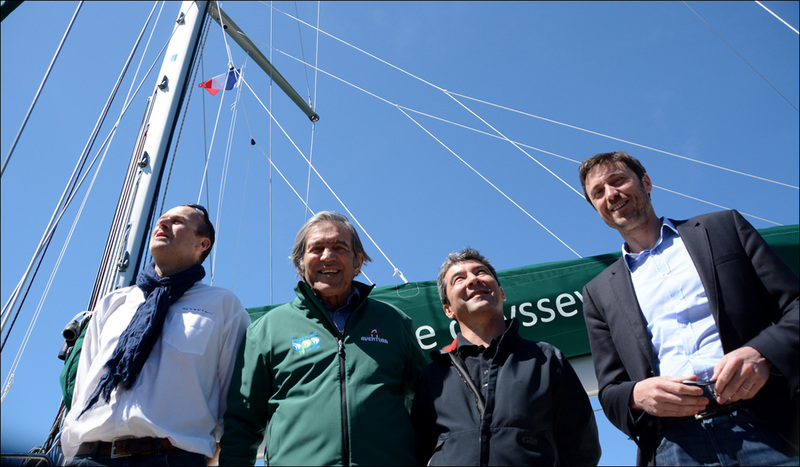 Next to Stephan stands Olivier Racoupeau, one of the top naval architects in the world. 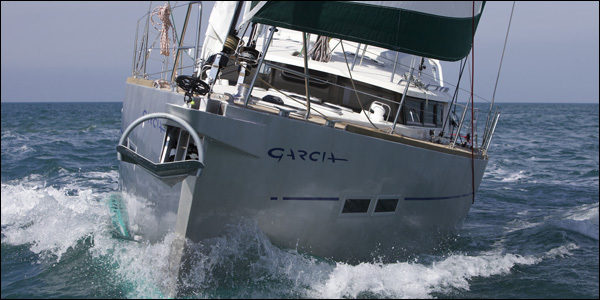 On the left is Benoit Lebizay, MD of Garcia Yachting, and the man who got the almost impossible task of turning a paper dream into a solid vessel to safely sail the oceans of the world. He did. Missing from the photo is the project manager Marc d’Arbigny, who did an outstanding job of bringing all pieces of the puzzle together so that Aventura was ready to leave Cherbourg on schedule. 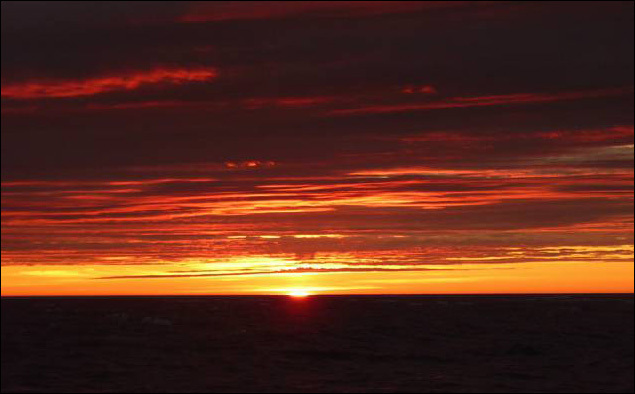 My grateful thanks are due to the supports whose logos adorned Aventura’s topsides throughout this voyage. Brookes & Gatehouse supplied all electronics and Philippe Gie, Sales Director France, oversaw their installation and commissioning. Along the route Mike Sudgen (UK), Brian Gifford and Rufus Van Gruisen (USA) updated and recommissioned the system, which has worked impeccably ever since. 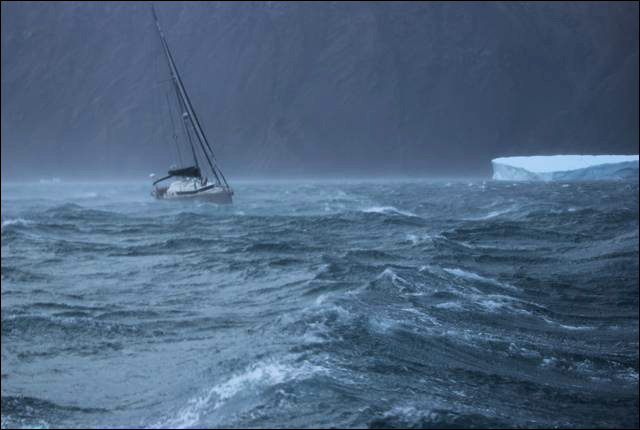 Flying through Bellot Strait with the help of an 8-knot current. 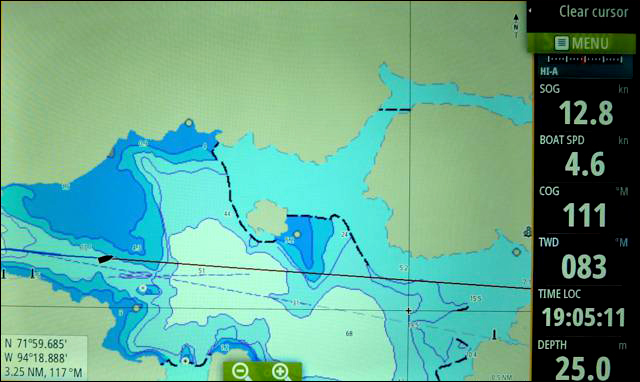 The electronic charts for the entire voyage were provided by C-Map, a subsidiary of Jeppesen Italia, where Laura Fanti in Customers Service as well as her colleagues Nicole Spagna and Chiara Tognoni made sure that I was always covered for any eventuality. As I mentioned in my previous report, our energy requirements on passage were amply catered for by renewable sources of energy. 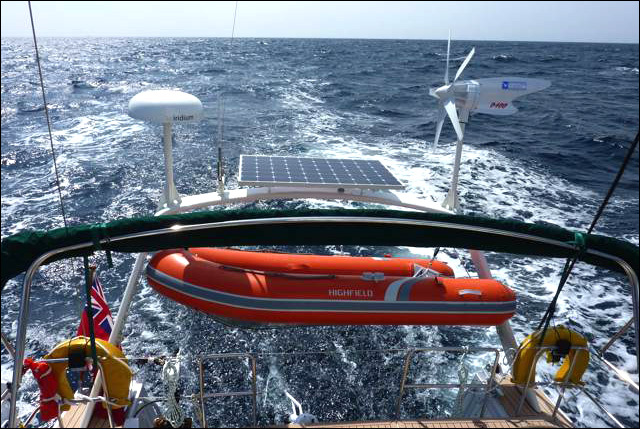 The Sail-Gen hydro- and D400 wind generator were supplied by Eclectic Energy, whose manager Pete Anderson shares my view that we have the knowledge and technology to harness all the energy we need from such sources as well as solar, if only we had the will. 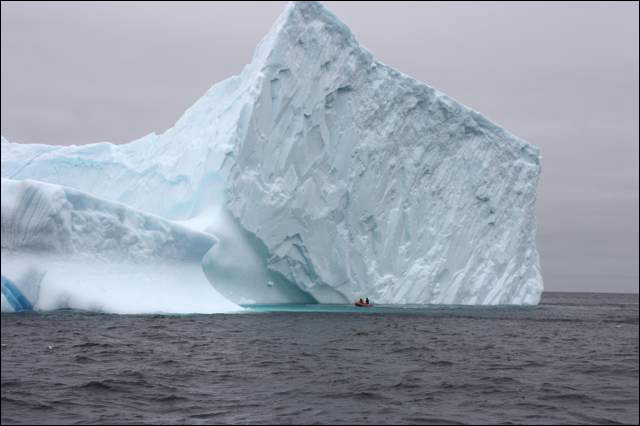 … or when we measured the tender for size against our cool neighbour. 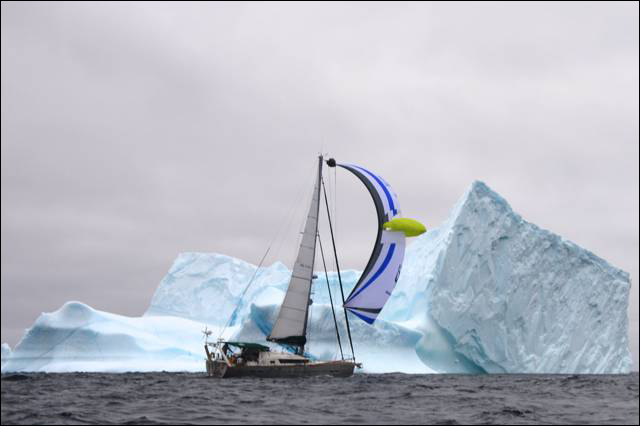 Günther Wörl, the owner of ISTEC, the company that produces the Parasailor spinnaker, had to wait until the last day of our Arctic voyage to finally get the promised photo of their sail against an attractive background. I am sure that this surprise will also delight my friend Akexander Knut. The menacing looking anchor at Aventura’s stem is a 33 kg Rocna kindly supplied by Mark Pocock of Canada Metal Brand on the recommendation of my friend Bob Mott. 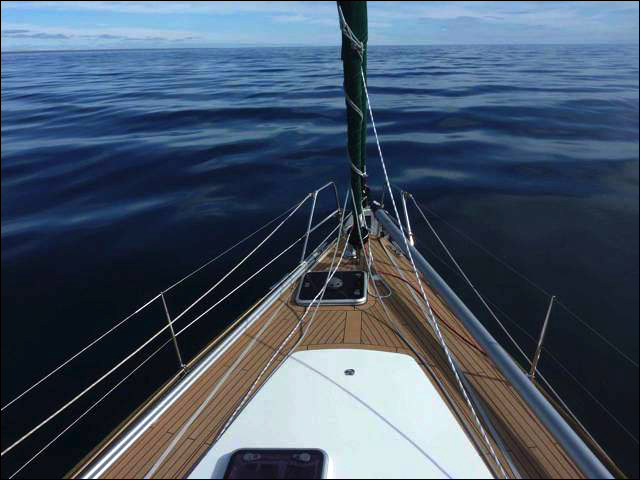 Our Rocna anchor performed perfectly throughout this voyage, and more than proved its worth during a 60-knot storm in Dundas Harbour in August 2014. 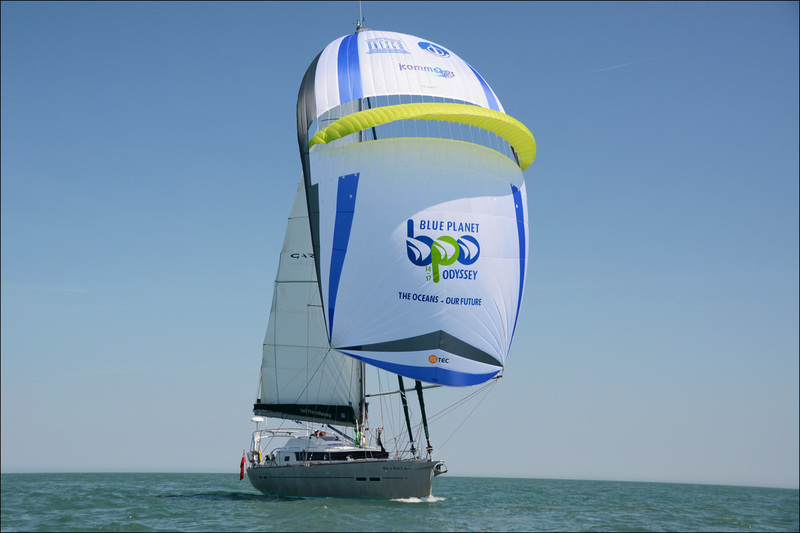 All Aventura’s white sails were made by Incidences Sails of La Rochelle, and I am sure that Philippe Touet, Charlie Pinot and their team will be pleased to know that after 24,000 miles their sails still look as good as new. 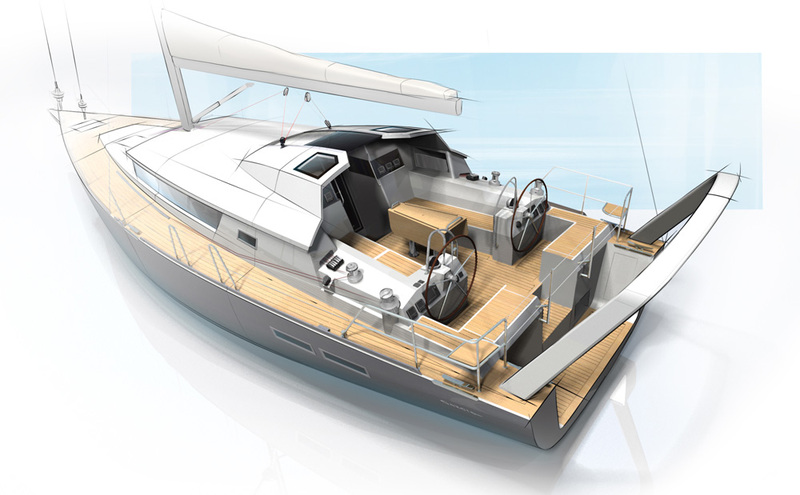 Also in the realm of canvas-makers, I want to thank Nicolas Beauvais, who produced our bimini and spray hood. Against all rules of good seamanship, I decided to leave both up for our entire Arctic voyage, on the principle that keeping the cold and rain out of the cockpit would make watches so much more comfortable. They did, and added a considerable element to the overall safety and eventual success of the voyage. The device under the boom is a Walder boom brake, a piece of safety equipment that any boat should carry, but most don’t. It acts as a powerful friction brake in a voluntary or accidental gybe by slowing down the otherwise violent swing of the boom. Only a few days ago a sailor was killed in a race when hit by the boom in that kind of situation. Thank you, Philippe Wyatt for supplying one for both this and my previous Aventura. 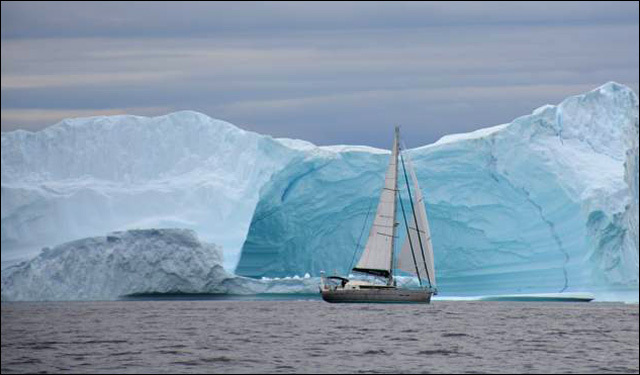 Hot I should add, as heated by our Volvo engine, which has also performed well throughout the Northwest Passage. 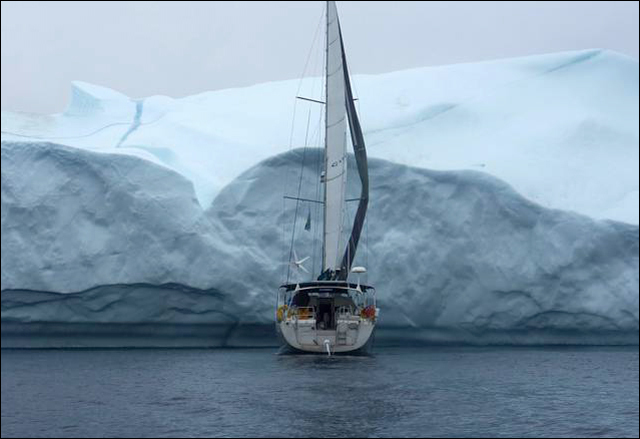 But once we had reached Greenland, it must have been hoping, just like the rest of us, for a well-deserved rest. So when that did not happen, it started breaking down for a variety of reasons, with the result that for most of the passage home we had no working engine. It was only at the stop in Falmouth that we discovered that most of it had been caused by contaminated fuel we had loaded along the route. 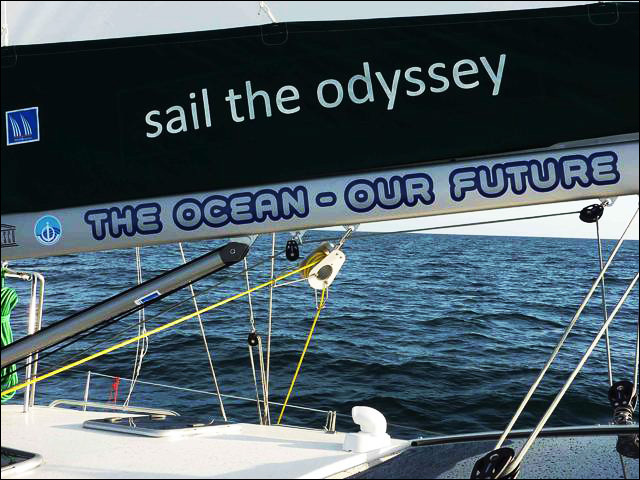 On both the boom and spinnaker we carry the message of the Blue Planet Odyssey inspired by that of UNESCO. In recognition for our concern for the environment, this illustrious organisation had pledged its support for both my voyage and that of the Blue Planet Odyssey. 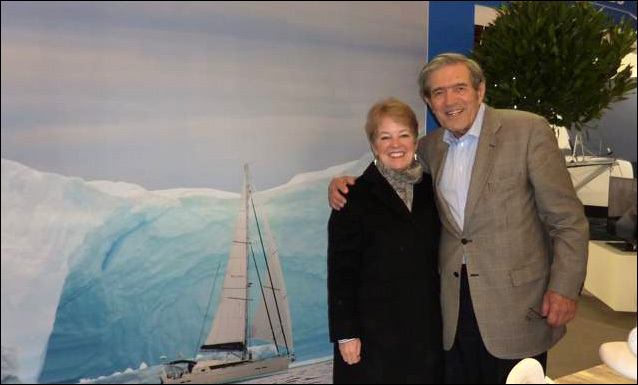 On the Garcia stand at he Paris boat show with our enthusiastic supporter: Wendy Watson-Wright, Assistant Director General of UNESCO and Executive Secretary of the Intergovernmental Oceanographic Commission. Soon I’ll press a key and send this report and photos to be posted on our website. 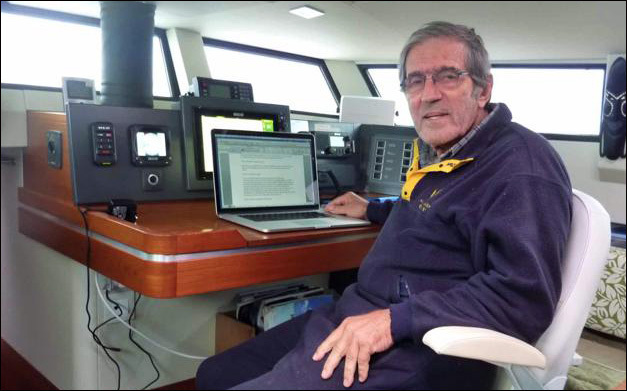 All our offshore communications go over the Iridium broadband satellite system supplied by Steve Bowden of Sea-Tech who also provided an ICOM M802 SSB radio. I am grateful for his valuable advice and to Pam House for her practical help. For our massive volume of emails, the London based server Mailasail has provided a first class service, and our grateful thanks to Ed ad Sue Wildgoose, Danny Saify and Helle Kristjansen of Nippy Networks. 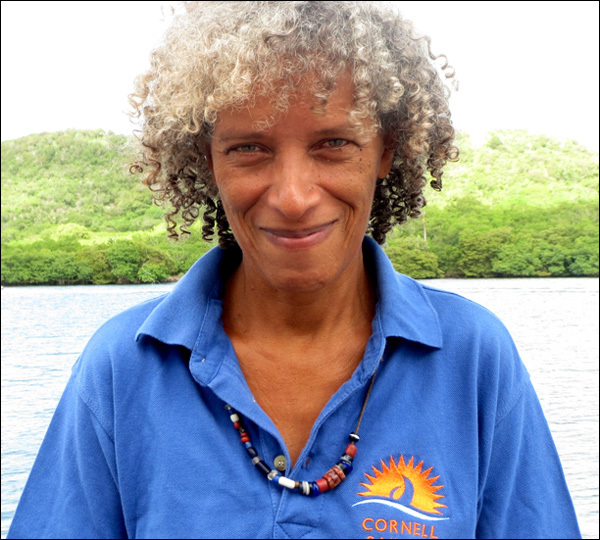 As my regular reports are going to cease, or at least be temporarily suspended, after my arrival in London, I want all those who have been following my voyage to know that the prompt posting of my reports on our website was due to our web manager Sylvie Branton’s efforts and dedication. Thank you, Sylvie. 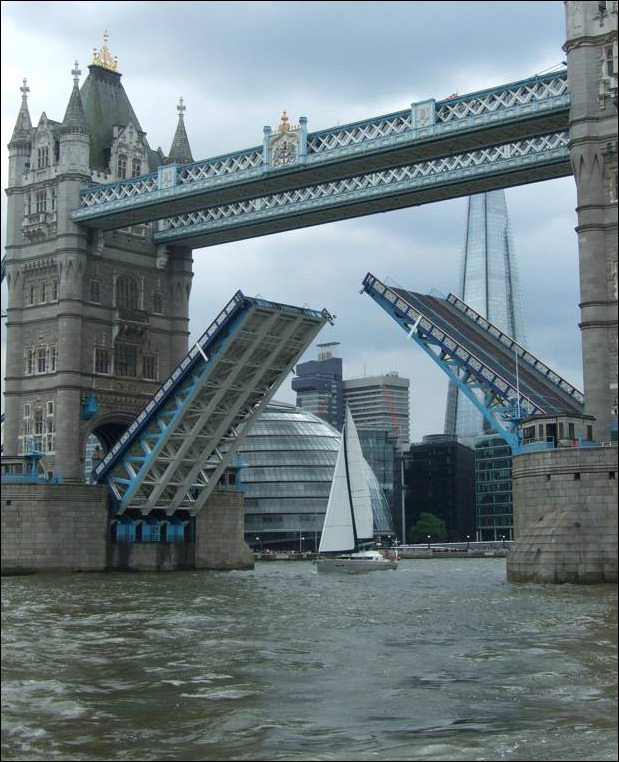 At this moment Aventura is sailing up the River Thames where the iconic Tower Bridge will be opened for us as it was last year, but this time to mark the conclusion of this truly epic voyage. I’ll be back tomorrow with a final report on the closing of this 24,000 miles long loop that had started from the same spot on 31 May last year.